India, the beautiful and headstrong sister of Come the Night‘s hero, Luc Delamere, fell in love with the rakish Devlyn Carlisle when they were just children. Innocent love bloomed into deepest passion when they reconnected as adults. But soon after the two are joined in a secret wedding bond, the Napoleonic Wars tear them apart. Then, betrayed by a comrade-in-arms, Devlyn is pronounced dead. India swears to continue her life alone, without the only love she’s ever known. But now he’s back – with the cold eyes of a stranger. Plunged deep into the mystery to discover who betrayed Devlyn, India vows to make the lost earl remember all they once shared, no matter how dangerous to her reputation – and her heart. 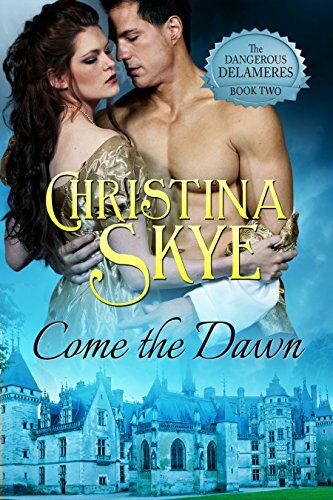 This is the Kindle version of Come the Dawn (The Dangerous Delameres Book 2) that you can also download and read on your computer and mobile phone. Kindle books are DRM protected and therefore, unlike ebooks that are in PDF or ePUB format, you cannot read this ebook without the official Kindle Apps.